The 2° episode of the success story Ludo Claessens is situated between 1995-2006, or the last 'complete sport season' that Ludo finished with both old and young pigeons. A period that was extremely good, since Ludo had bred a 'small stock' of pigeons that was capable of excelling up to national level, yes… was even busy developing a 'power grip' in the national NPO races from Orleans, the favourite classic of the 'master from Putte'! A 'small stock' that came about through a boundless austerity by the SELECTION! Because if there is one thing that we have remembered from the 1° episode, it is the 'slogan' that Ludo had impressed in his 'head' and used as a guiding principle to find the shortest way that would lead to top successes in the pigeon sport, and that is …daring to select when it hurts! The secret… now secret (? )… is getting rid of the 'good pigeons', and only keeping the 'very best'! It will now be clear to you that Ludo Claessens uses a 'sharp knife', otherwise he could never get this far, and never be able to stand one´s grounds for so long. You will probably have noticed that Ludo is not so much looking for real 'breeding couples'. Rather he believed in 'dominant breeders'! Pigeons that after producing a 1st crack pigeon, soon brought a 2nd crack pigeon into the world… you can go further with such pigeons, you can make a stock, you can go to war! So as Ludo puts it: pigeon sport is not as much a matter of chance as some people think! You have to be able to read the pigeon sport and… be able to write it… it is just so difficult to explain! 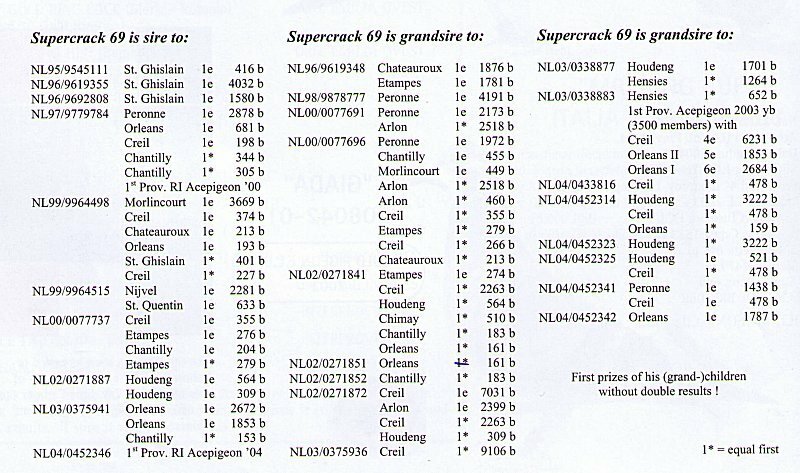 Real super breeders in the past on which the Claessens colony is based, call them 'breeders of dominance', were the 'Fokstier'… the 'Blue White pen Orleans'… the 'Dark 03'… 'Voske 54'… 'Dik Licht 56'... and of course the 'Late Donkere', which within the shortest space of time grew to be the new 'figurehead' of the Claessens-colony! With the 'dominant', say the over dominating success line of the 'Late Donkere', his superior son the 'Favoriet 65', and his grandsons the 'Witpen Bliksem' and the 'Young Supercrack'... Ludo started to easily dominate the 'middle distance happenings' in the Netherlands… and as I look today then I clearly have to add the 'Supercrack 69' (son of the 'Blue 59'), even though on closer inspection he is a pure inbred product of the earlier mentioned stock pigeons. 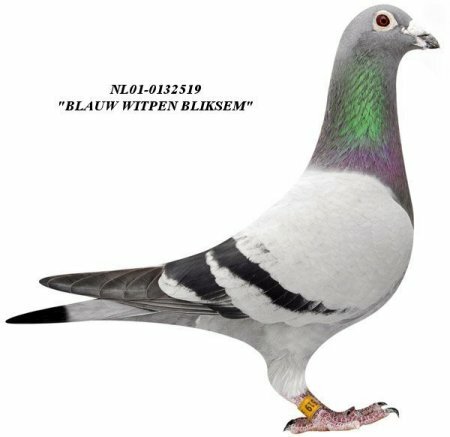 In addition there was also successful input from a touch of 'strange blood', with top breeders and crack pigeons so as the 'Old Blue Slaets'... 'Blue 01'… the 'Bliksem' ... and lastly 'Mr. Tours' and the 'Vedetje'… crossings products that took like butter to a slice of bread and that in combination with the strong inbred Claessens stock, rang in an 'explosion' of new top talent! In contrast to his begin years, Ludo now had to dig very deep into his ´inside pocket´ for some of these 'super pigeons', a few were even the most expensive pigeons in a 'public auction'… yes 'proven top class' today comes with a price tag, which Ludo has now discovered. Now, with these pigeons, Ludo didn´t only introduce a touch of 'fresh blood' into his stock… it also enabled him to once again inbreed to his 'success lines'! A breeding strategy that lies at the basis of the pigeon sport at the very highest level… yes, from 30 years of uninterrupted 'top pigeon sport'! And pigeon loving Holland has experienced this, because Ludo Claessens wasn´t for nothing considered… and proclaimed the 'greatest Orleans specialist' of the Netherlands. In the period 1974-1995 he had already booked down 4 x 1° Nat NPO Orleans in '87, '91, '93 and '95 (even including 1,2,3,4,5° Nat NPO Orleans 8.210 p. in '91) and 9 x 1° Provincial District I Orleans. In this 2° episode in his pigeon career Ludo Claessens carried on in the same 'relentless' manner, where the counter at the end of 2006 stood at no less than 6 x 1° National NPO (in 2001 with 'Red Quinty' against 11.149 p., in 2002 with 'Kirsty' against 8.072 p.) and 18 x 1° Provincial District I Orleans, just phenomenal! Is the top quality, or the top class in the Ludo Claessens lofts then so obvious, you are probably asking yourself? Whoever studies the honours lists of the Claessens pigeons, has to dare to conclude that the distinction of these Claessens pigeons towers far above the rivalry. Ludo 'got his kicks' from 1st prizes, and a weekend without a 1ste prize is for him a 'wasted weekend', and he sees it as a failure! There where the pigeons from the rivals possessed a 'motor' with 4 gears, it seemed as if the Ludo Claessens-pigeons were capable of changing to a higher gear… and being able to use a 5th gear. It even seems like they now have had a 6th gear fitted! So fantastic… so surprising… how the pigeons often rant and range, so dominant is their performance rhythm! These pigeons race sportingly hard to their goal, and that is… the 'victory'! Best Middle Distance racer 'in the world'! 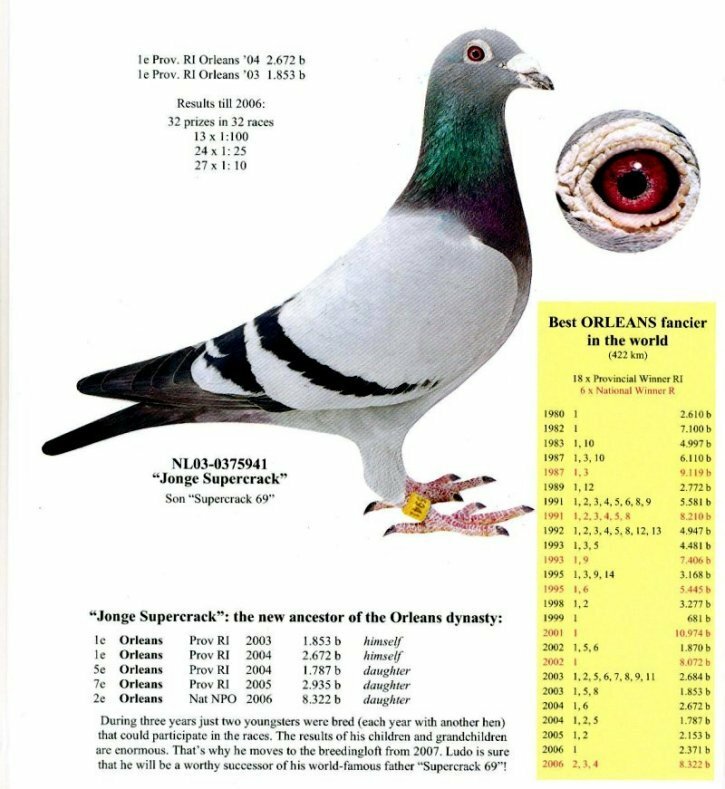 The trade mark of Ludo Claessens is of course the phenomenal 'super pigeons' that he owns. The results prove that in abundance. Ludo makes a correct marginal comment by many reports that appeared in the papers and magazines. Nearly all fanciers speak here only over their best results per year, so over 'single results' and not over 'all results'! If you want to live up to your name of 'great champion', then you have to dare to lay 'ALL' your results over the entire season on the table, and more importantly also 'dare to publicise' them, both good and not so good! Only in this way can the reader judge the real worth of a colony. Ludo has hit the nail on the head once again, let's then take a look at ALL THE RACES (so both good and not so good) with the RESULTS over the last 3 seasons that close this 2nd episode (2004-2006). 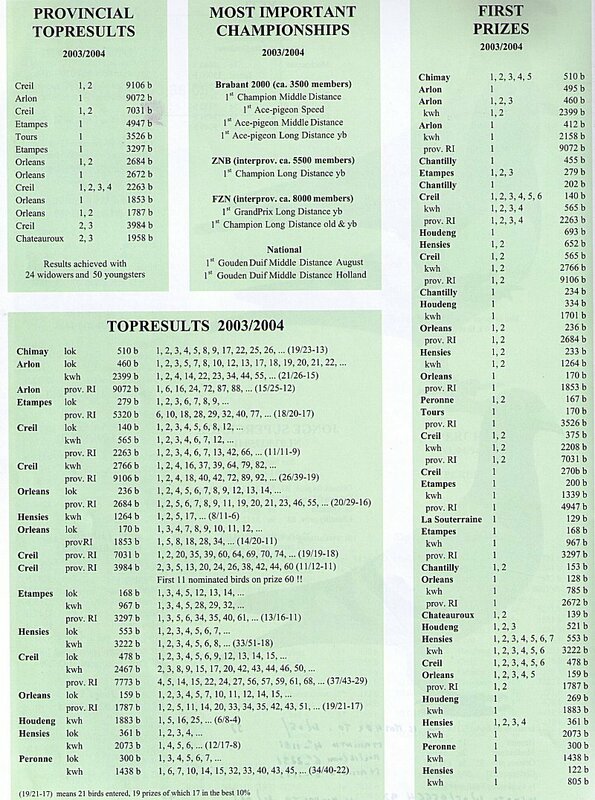 When you then for 2006, which is also the last 'entire sport season' that Ludo has completed… can produce and end balance of 132 nominated pigeons, with 109 prizes (per 4), 94 per 10 and 38 per 100, with every week at least the 1st prize at club level, then you belong in the gallery of the 'greatest' in our sport! More even, the end balance over the last 3 seasons (period 2004-2006) speaks volumes, with a total of 356 nominated pigeons, wherefrom 285 prizes per 4 (or 80% prize ), 232 per 10 (or 65%), and no less than 92 per 100 (or nearly 26%), then the logical question is… who and where in the world ever performed better than Ludo Claessens? The answer is… NO-ONE!!! No, no-one can present what this Ludo Claessens has realised, and this calculated from ALL the results of the races in which he took part at provincial level in the middle distance! Just phenomenal… as a result of which we can rightly say that at the end of 2006 Ludo Claessens had grown to be the 'best middle distance racer in the world'! And figures… they never lie… judge for yourself! The above figures speak volumes… but when you also know that this was all achieved with a yearly maximum of 20 widowers and 40 youngsters in the lofts, then it is even more 'impressive'! And breeders? Maximum 8 to 10 couples… Ludo didn´t need more. 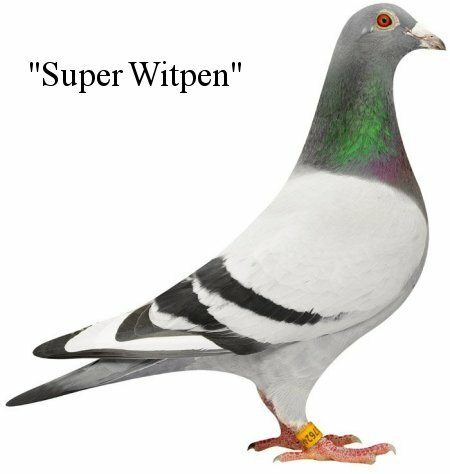 Purely because in Putte the word 'breeding pigeon' means… 'dominant producers'… pigeons which every year once again bring forth 'top pigeons', and during their life have brought multiple real 'cracks' into the world! Because in the eyes of Ludo Claessens 'breeding pigeons' are 'very rich'… breeding 2 or 3 rounds per year (Ludo doesn´t do winter breed) and for the rest of the season they take it easy. So he doesn´t need any pigeons amongst them that can´t earn their 'expensive pigeon feed'! 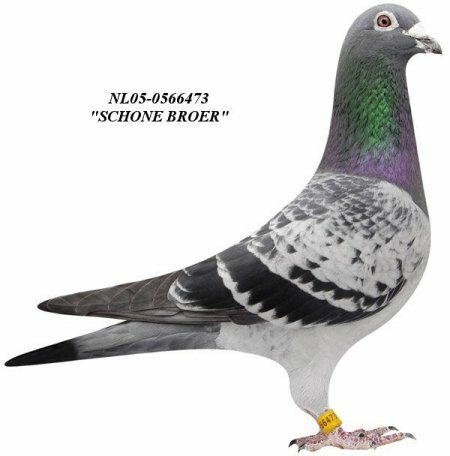 It is the same train of thought by the racing pigeons… virtually every old pigeon in the racing loft is a superior 1st prize racer or an exceptional 'crack pigeon', moreover a 'conditio sine qua non' to be able to remain for the winter, there in Putte. To be able to strictly select from them every year, must be a 'dream' for many fellow sportsmen… yet, it was pure reality in Putte. And in this period he never budged an inch from his philosophy… just over 60 pigeons remained for the winter. The more good pigeons you have… the stricter you have to be… and Ludo was not planning to build extra boxes! That´s why Ludo can and may 'talk hard' when he says… I can do anything with 60 pigeons! Ludo Claessen´s motto seems to be perfect! Let us illustrate this with the generation of 'super pigeons' that reside in the racing and breeding lofts in this 2° period 1995-2006. (Let us say beforehand that the 1st prizes with a star '*', stand for 'equal first', which means that only a pigeon from the same loft was faster, which still means joint 1st prize against the competition!). The pin characters that descend out the first period, but have obviously made their 'mark' on the further extension of the colony are undoubtedly the 'Supercrack 69' and the golden stock bear the 'Late Donkere 375/93'! The 'Late Donkere'… a 'wonder breeder'! The 'Late Donkere 375/93' self son of the 'Donkere VA 195/90' x the 'Dik Licht 56'… would grow to be one of the most important sounders of the colony. His 'descendants' literally sowed 'terror' in the pigeon troops, he is father of the 1° Nat. NPO Orleans '95 and the 1° Nat NPO Orleans '02, grandfather of the 1° Nat. Orleans '01 and great grandfather of the 2° + 3° Nat.NPO Orleans 2006 and the 1° + 3° Nat NPO Orleans 2007! The 'nest sister Favoriet 65', the 'Licht 66' 466/01 were 2° Prov Ace pigeon Middle distance youngsters '01 (after fellow loft mate). -2 excellent daughters of the 'Late Donkere' are without doubt 'Kirsty' NL02-0271840 and 'Nest sister Kirsty' (a phenomenal top breeding hen, especially when coupled with the 'Kleintje 22'). 'Kirsty' won 1° Nat. NPO Orleans 8.072 p. in '02 and was fastest of 11.931 p.! -Another phenomenal daughter is the 'Schoon Donker 83', or the mother of wonderboy 'Young Supercrack'. 1° Prov D1 Arlon 9.072 p.
1° Prov D1 Etampes 3.297 p.
1° Prov D1 Chantilly 2.383 p.
1° Prov D1 Pithiviers 2.826 p.
1° Prov D1 Orleans 2.153 p.
The' Blue White pen Bliksem' is grandfather of the superior 'MAXX' or the 1e Nat Ace pigeon Late races in 2004, the success line in the lofts of Kerstens-Claessens! In 2006 this miraculous 'Bliksem line' gave A.Clarijs & Son the 1e Nat. 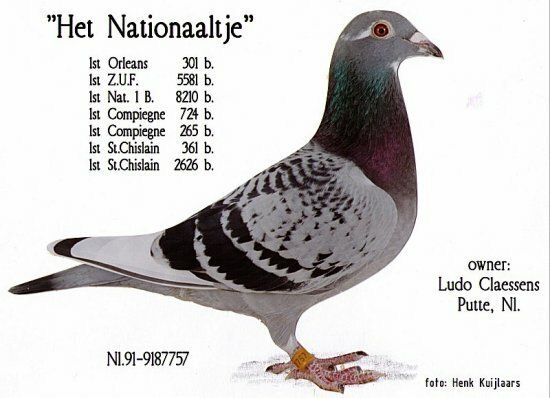 Orleans NPO against 8.322 pigeons just ahead of Ludo Claessens himself who won 2+3+4e national, and was then here only beaten by is own sort, or should we say that the Claessens-pigeons won the first 4 National! - Another top racer from a coupling of the basis lines is the 'Red 35' NL-0526035, who is a son of the 'VALE 22' (a half-brother of the earlier mentioned BLUE WHITE PEN BLIKSEM) x 'SCHOON LAAT LATE DONKERE' (a full sister of the Favoriet 65, Kirsty, Nest sister Kirsty etc…). 3° Prov D1 Pithiviers 7.794 p.
3° Prov D1 Creil 4.791 p.
13° Prov D1 Orleans 2.935 p.
He is full brother of the NL06-0751087 who was 1° Prov D1 Ace pigeon Middle Distance/Long Distance. 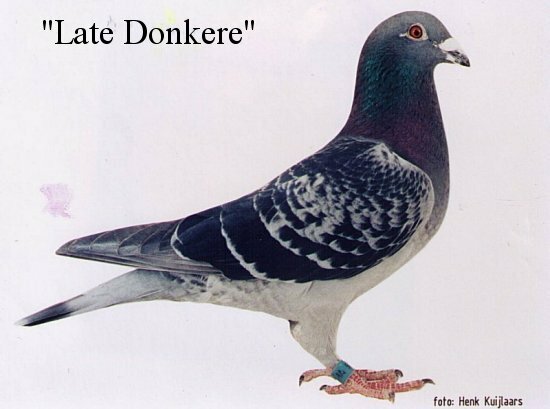 The 'Late Donkere' was one of the pushing forces behind the top successes in the colony of Ludo Claessens, especially in combination with that other breeding phenomenon from Putte: the 'Supercrack 69'! The 'Supercrack 69'… a giant of a 'super breeder'! 1° Prov D1 Reims 2.763 p.
In '05 he became father of the 'Blue 92' 492/05 that won 1° Prov D1 Ace pigeon FZN (and is self mother of the 'Kleintje 10' 110/06 (fastest from Morlincourt 26.801 p., 1° Hensies 124 p…), while in 2006 he became father of the 'Super Blue 03' 103/06 that won 2° Nat D1 Orleans8.322 p.! Ludo decided at the end of 2006 that it was high time to put the 'Jonge Supercrack' in the breeding loft for good… A 'golden move', because in 2007 he became (coupled with the 'Vedetje') father of 2 'super cracks' in the form of the 'Super star 152/07' and the 'Super White pen 465/07' which respectively won 1° + 3° National NPO Orleans 9.096 p. in the very last race of 2007, which would also be the very last race that Ludo would participate in! An unbelievable end to a pigeon career! In 2008 he became father of 'Super Blue 629/08' which in the colony of Kerstens-Claessens lies at the basis of the title of 1° Prov Champion youngsters Brabant 2000 and 2° National Champion youngsters… but that is for the 3° episode of this story! 2° Prov D1 Orleans 3.574 p.
5° Prov D1 Creil 7.332 p.
5° Prov D1 Etampes 3.494 p.
6° Nat NPO Chateauroux 9.049 p.
10° Prov D1 Creil 3.954 d… etc. The 'KLEINTJE 22' NL02-0271822: phenomenal super crack which is also worth its weight in 'gold' where the breeding is concerned. He illustrated perfectly the enormous perseverance of the Ludo Claessens pigeons. 1° Prov D1 Etampes 4.947 p.
1° Holdn kwh 3.383 p.
1° Prov D1 Creil 7.031 p.
1° Prov D1 Creil 2.263 p.
2° Prov D1 Creil 3.984 p.
4° Arlon kwh 2.484 p.
4° Creil kwh 1.832 p.
5° Prov D1 Chantilly 2.383 p.
* 'Klein Bont 94' NL05-0566494 that won 11th Prov D1 Orleans2.935 p, and in turn became in 2006 mother of NL06-0751103 that self won 2nd Nat NPO Orleans 8.322 p and shined further with a splendid 8/9. 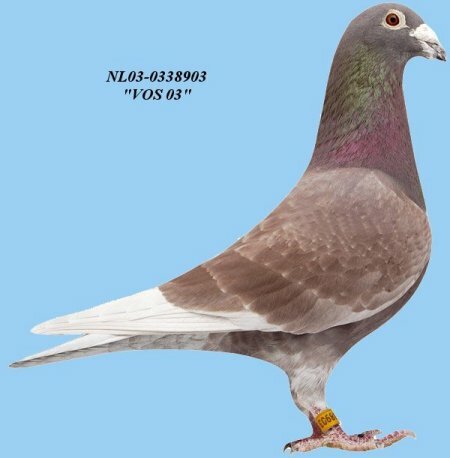 Here out stems the NL06-0751110, a dream pigeon, and favourite pigeon and top favourite for the future for Ludo Claessens, and immediately showed what he was capable of with 1st Morlincourt 1.682 p (also fastest of 26.801 p), 1st Hensies 124 p (equal first), 19th Prov D1 Chantilly 4.148 p, and 28th Prov D1 Pithiviers 3.042 p.
1° Prov D1 Creil 4.791 p.
1° Prov D1 Sens 1.890 p.
11° Prov D1 Chantilly 3.526 p.
In the breeding loft she also developed just like her brother 'Kleintje 22' into a real breeding talent, so was she mother of the NL06-0725161 whose wins included 1° St.Quentin 1.752 p. (fastest Prov D1 ca 8.000 p), 1° Pithiviers 248 p. (7° Prov D1 3.042 p), and NL06-0725164 with 1° St.Quentin 980 p. (1° fastest Prov D1 + D1I from ca 9.000 p.), 12° Prov D1 Chantilly 4.148 p. and 17° Prov D1 Pithiviers 3.042 p.
The career of ´The 64´ NL06-0725164, also a full brother of ´Kleintje 22´, began hopeful with 1° St.Quentin 980 p. (1° fastest Prov D1 + D1I from ca 9.000 p.), 12° Prov D1 Chantilly 4.148 p. and 17° Prov D1 Pithiviers 3.042 p.
1° Nat NPO Argenton 4.318 p.
1° Morlincourt 321 p. 1* Creil 209 p.
In 2005 he won 1° Prov D1 Orleans for the 2nd year in a row, followed by a 1° Nat Argenton NPO. In the next race the tension in the Ludo Claessen's household was tense… until 'Simply the Best' returned with… 2 broken legs, which resulted in him losing his 'national victory' by losing 30 minutes between the time of returning home and being clocked. Ludo entered him for the races again in 2007. He survived the 'disastrous Pithiviers', after which Ludo gave the 'apple of his eye' his 'more than deserved place' in the breeding loft! The breeding loft from which he was stolen during the cowardly theft of 17 February 2008! 1° Prov D1 Creil 5.665 p.
1° Creil 216 p… etc. 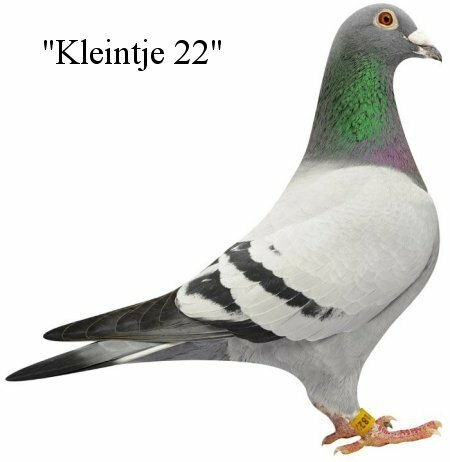 1° Prov D1 Orleans 2.371 p.
1° fastest of Morlincourt 26.801 p.
One for one top pigeons bred out the 'old inbred stock', out those 'dominant breeding lines' of Ludo Claessens! 1° Nat NPO Tours 16.154 p.
23° Nat NPO Tours 14.898 p.
2° Prov D1 Sens 4.239 p.
8° Prov D1 Orleans 2.935 p.
9° Prov D1 Chantilly 3.526 p.
10° Prov D1 Creil 4.208 p.
- 'Klein Donker Tours 474/05' (nest brother of 'Donker Tours'), whose wins included 16° Prov D1 Creil 5.084 p., 33° Prov D1 Blois 1.868 p., 67° Prov D1 Pithiviers 7.794 p… and is father of the 3° Nat NPO Orleans 8.322 p.! In 2007 'Mr Tours' would then become father of the 'Chantilly Hen 452/07' which won 1° Prov D1 Chantilly 3.216 p. (with a 6' lead) and her nest mate that won 1° Prov D1 Orleans 2.087 p. and 6° Nat NPO 9.096 p.! ´Chantilly Hen´ in turn is mother of ´Marianja 619-08´, the wonder hen that in 2008 raced by Kerstens-Claessens 9 times per 10 including 1st Prov. D1/D1I St. Quentin 17.496 p.
In 5 different lofts, by 5 different fanciers, each with their own racing system, 'fantastic' results were achieved with children and grandchildren of this 'new fanatic' in the breeding lofts of Ludo Claessens: 'Mister Tours'! Who hasn't dreamt of owning such a loft of 'super pigeons' that is really 'outstanding' for the entire competition! And in this 2nd period of the pigeon career of Ludo Claessens, we haven't said a word about the 'Grote Blauwe (Big Blue) 96' 696/00 (1° Peronne 1.973 p, 1° Arlon 2.518 p), the 'Red Katoog 817/98' (1° Creil 1.722 p., and 2° Prov D1 6.454 p…. and father of 'Red Quinty' 1° Nat Orleans 11.149 p), the 'Blue Moon 293/99' (1° Prov D1 Creil 9.110 p., 1° Holdoung 1.757 p., 2° Prov D1 Creil 4.867 p., 2° Prov D1 Chateauroux 1.772 p…), the 'Blue 84' 784/97 (1° Prov Ace pigeon Middle Distance '00, 2° Prov Ace pigeon Middle Distance '99), 'Schone Broer 473/05' (1° St.Quentin 2.239 p. and 1° fastest Prov D1 ca 10.000 p., 1° Harchies 1.018 p. and 1° fastest of ca 5.300 p., 1° St.Quentin 1.752 p., 1° Pithiviers 248 p.), the 'Vos 03' 903/03 (1° Orleans 2.684 p., 2° Prov Ace pigeon Long Distance '03 FZN, 7° Nat Ace pigeon Middle distance '04), the 'Light 77' 877/03 (1° Holdoung 1.701 p. and fastest of 6.500 p., 1° Hensies 1.264 p. and fastest of 5.000 p.), the 'Blue 48' 448/01 (1° Tours 3.526 p. and 1° Prov Ace pigeon D1 Middle distance '01), the 'Vale 22' 722/00 (2° Orleans 4.358 p., 2° Orleans 3.078 p., 5° Creil 3.984 p., 6° Creil 4.939 p., 6° Nijvel 3.268 d…) etc… one for one 'toppers' in the racing lofts of Ludo Claessens! Ludo Claessens was sitting on 'roses', bathing in an opulence of class pigeons, that in 2006 once again brought home the 1° prize every week… nothing or nobody seemed capable of stopping this Ludo Claessens, of breaking through the 'supremacy' of this wonder colony! This was without doubt the 'best team of pigeons' that Ludo had every bred… and with which he was described in all the 'media' as the 'best Middle distance racer in the world! 1° Oriental Cup Race Japan (ca 700 Km). More than 4.000 pigeons were assembled in the 'International Loft'. Only just over a hundred made it to the end. A 'grandchild Nationaaltje' took the victory with a 13 minute lead, in very tough circumstances! 6° Nat. Chateauroux (NL) 16.340 old pigeons (out a Claessens-hen) "
" A hen was lent to sport friend Sakis Minowioudis, and out of these two eggs came in 2003 from Nat. Troyes 'Prov. 5' the 8° + 12° Prize against 9.981 p.! 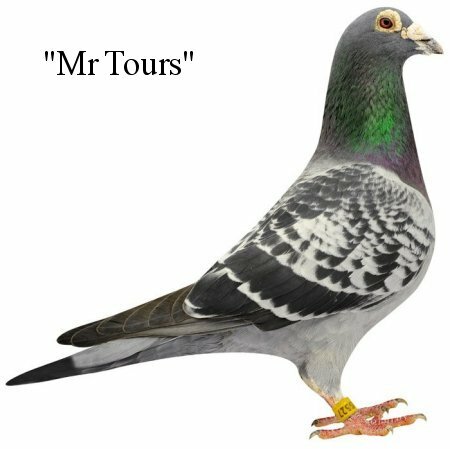 Real top references that clearly reflect the 'world class' of the modern Ludo Claessens pigeon!